The Redelineation exercise is meant to make parliamentary representation more equitable, to the interest of those with less bargaining power. This provision gave power to Parliament in general to recommend changes and reviews of constitutencies. This is in line with the preservation of Article 46 of the Constitution, which allow for the Creation of New Parliamentary seats by way of a constitutional amendment to it. If you wondered what happened in year 2003, the oberall Redelineation effort also included the increment of parliamentary and state assembly seats by way of a constitutional Amendment of Article 46, among others. During this 2003 redelineation effort which requires the approval of 2/3 Parliament for constitutional amendment, in Selangor alone the Election Commission created 22 new seats! Not suprising, the ruling party subsequently won it’s biggest number of seats in the 2004 General Election adapting this new redelineation structure with many new seats created. It is very tempting, and to a huge extend, to say that, the 2018 Redelineation effort is to favour the ruling party. Many among us argued that yesterday and today. However Political Scientist Dr Brian Rathbun (2007) raised an interesting point on conflict between “equality” and “fairness” in drawing up constituencies line. He further claimed that a country that implements a popular voting system, failed in practicing “Democracy” from two aspect :- Legislative aspect (1) and Sociological aspect (2). Take a simplistic (for the sake of the point) example, say, 60% of the electorates are urbanites, while remaining 40% are rural folks. In a popular voting system where constituencies are drawn purely based on Equal distribution of voters, The Government who won the election will only need to announce measures/policies/manifestos that would secure the 60% urbanites to win a popular vote. Reducing petrol price (assume that the consumption of petrol is minimal and insignificant in rural areas), Providing low cost housing for urban poors, or, using “English” as main medium of education which would excites alot of urbanites etc, will put the rural folks at a very disadvantaged position. Their voices NEED NOT be heard because they can never affect the winning of a government. Governing party will never be incentivised or motivated to allocate Government budget towards this fraction of the society. In fact, in many countries that adopts popular system, where number of constituents in a constituency does not differ much from one another, the views and interest of citizens from rural or sub-urban areas are always not taken into equal consideration. Whereas based on Dr Rathbun’s ideology, the Electoral System factors in socio-economical considerations. Greatest theorist and jurist on “Democracy”, one like Finis or Rawls pressumably (rawls is more direct) in their writings accorded a more holistic interpretation to democracy – that “Majority wins” is not the most essential aspect of democracy, there are rules against tyrannism, and eveyrone’s interest (fundamental human rights) must be taken into consideration. An Electoral styled redelineation system effectively takes into account the interest of people not only as “individual”, but also factors in sociological (rural urban), cultural (in Malyasia, perhaps Religion is factored in too), economical (poor, middle class, rich) and various others in the form of “WEIGHTAGE”. Take another simplisticview as an example, Damansara has 150,000 voters who are middle class and working class. their needs/wants/desire from the government are likened to those of urbanites. And due to the density of the constituency, a MP can easily access, logistically to the 150,000 voters because they are staying within a small area and vicinity of the constituency. On the other hand, you have people who stays in PADANG RENGAS, with , say, 35,000 voters who are farmers, fisherman, and working level citizens. 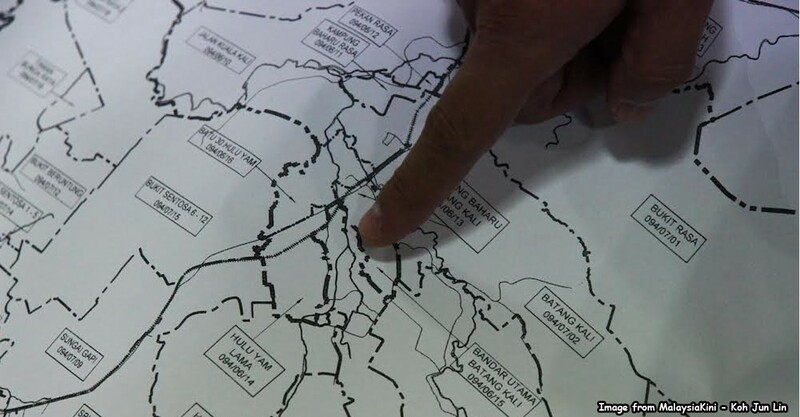 Lets assume Malaysia only has 2 constituency, of DAMANSARA and PADANG RENGAS. in a Equal Distribution system, people of DAMANSARA shall dictate how policies are make through their MP/Government (they will win). the policies will then be purely targeting middle/upper income. People in PADANG RENGAS who are farmers will never get a say. their numbers are too low to make a different. You now then ask, which system should Malaysia , and as a matter of fact, the “World” adopt? Fairness, or equality (in respect to sociological, cultural, and economical background)? Many effective and advanced countries, in a way or another will implement the electoral system to protect the interest of weaker groups. Take for example, in Australia, the Senate (upper house) of Australia is very powerful, it can veto (block) bills from the lower house. In fact, the Australian Constitutional Crisis happened decades ago, when it’s Senate refused to approve the Budget bill, forcing it’s Government General to suspend and fire the Prime Minister since he couldn’t get the Budget bill passed to run the Government expenses, forcing another General Election. In this powerful Senate of Australia, Every states have 12 senators (except Northern Territory), regardless of the size of the populus. Victoria state has 6million population, while Western Australia has 2.6million population, but both states has 12 senators each representing them in the upper house. Therefore, can we say that the Election in Australia is stolen? Because it is very difficult for the political parties to campaign in Victoria states, to have to campaign to 6 million people, while political parties only need to win 2.6million western Australia to gain similar (12) representation in the senate of Australia. Even in the USA, where it’s senate has the power to not affirming Judges, among others, every State in US regardless of size, has only 2 senators. California, with 40 million populations, only has 2 Senators representing them, whereas State like Wyoming, with only half a million population (1/80 of California), is also represented by 2 Senator. Therefore, in the US Senate, the value of vote of a citizen in Wyoming, is 80times to that of a Californian. As a conclusion, the electoral system , however undesirable to the taste of many, is in place to ensure that those who are in position with less bargaining power, are adequately represented in the Houses of parliament or the legislative. We may disagree with this principle, but there should always be a way balance the interest of the less advantaged. At least up until few hours ago. The appointment was done in 1st November 2016 (a month short of a year), so you can seek comfort in knowing that he was at least the chief “operation guy” of MAB. 2 BEFORE His appointment as CEO and COO, He run MASwings. MASWings might sound foreign to many in Peninsular Malaysia, but for many Sarawakians and Sabahans. it is their bet for a good commute that would save them hours or days to get home. It is MAB’s regional airline servicing rural route in East Malaysia. 3 He was the Director of Operations of MAB from 2012-2015. 4 He worked for the Aviation Industry for 37 years. 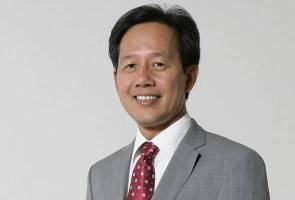 5 He is a HARVARD University Alumni, holding credential in Advanced Management Programme from the Harvard Business School. General manager for technical and development. I have a hardworking friend. He dedicates about 70%-80% of his waking hours working, attending meetings, drafting slides and notes, coordinating projects, and is known among his colleague as a clear headed iron man. He however, likes to spend his remaining non-working time in pubs or fancy eateries, or when he has a weekend free of duties he would travel to nearby tourist attraction to enjoy his day of sight seeing. When he travels abroad for work, he habitually, where possible takes 1 extra day off towards the end of his hectic and tightly scheduled work trip, to sight see. In his facebook, he posted near to nothing on his work. He refuses to post his work experiences or mention anything about them in social media. Same however couldnt be said for his non-work-related endeavours. He shared almost every non-work leisure activities and indulgence in both facebook and instagram. Beautiful photos, selfies, wefies frequently flood his timelines. I quite enjoy reading his postings and often liked them. Last week; i hung out briefly with a group of our common friends, who knew very little about his work. He didnt join the session. “Dia nie tak payah kerja kut. Makan minum melancong je tengok”. “I want to have a life like him. Goyang kaki makan minum travel all the time. Wonder whats the trick”. I kept quiet and reminded myself again, that the result of judging another purely from their social media postings, is one of utter abhorrence, and shame. Every Malaysian knows very well, that we still have a long way to go, to compete with the world economic giants. Our GDP, GNI, or any Economic indicators for that matter, however, showed significant improvement against the set back of a global economic recession. Recent Global Competitive ranking done by World Economic Forum elevated us by 2 spot to 23rd spot in the chart that sees stiff ranking among 137 countries. It is only human, that we don’t feel any justification for this achievement : Afterall, we are an emotional bunch of people, judging more often than not based on our feelings than rational-cognitive-ability that the Homo Sapiens species have since 70,000 years ago seek pride in possessing, which eventually distinguished us from every other mammals. That aside, the biggest complaint sung in unison, has to be “the pinch we all felt” collectively in each of our individual pockets. We attribute it to none other than “Escalating cost of living”. However, without much understanding on what “Cost of living” actually means, we went on to live by the very notion that most of our routine sufferings to date, were caused by it. With greater economic achievement, comes greater expectation of lifestyle. And with such heightened expectation of lifestyle, comes higher cost to live by it. The crux of the issue however, is pretty much relative in nature. I would say, we have benchmarked our lifestyle expectation wrongly. Without the Productivity and discipline of a working class Japanese, Korean, or American, we thought we deserve to enjoy their kind of lifestyle, too. They invented Iphones, Samsung Galaxy Notes, and sold these phones to their citizens. We never invent iphones or galaxy phones, or anything near to those, nor do we have the capacity to attain that sort of productivity and discipline level required to produce these gadgets. Yet, we want to enjoy it. I’ve blogged about this early and you can read them HERE. To cut it short, here are some ideas to help us cope with our depressing feelings on escalating cost of living. Instead of perpetuating the same complaint every Thursday over rising fuel price, one can make a change for a start : car Pooling. It is as simple as downloading an App like WUNDER , which work wonders. It has its pros and cons, and is highly dependent on how far one can overcome over-exeggarated fear on security related issue. Unlike solo ride UBER or GRAB (which are excellent alternative to carpooling), the cost is pretty much dependant on how well you can plan your journey with your fellow travellers and drivers. True is, we over estimate the need to be flexible with travelling on a usual routine-filled day. We thought, we “might” need to go out to do something and to be save, it’s better to have our car around. Truth is, unless your work essentially requires you to travel to few different places everyday, your car is quite stuck in it’s parking place (that cost you money!) for most of the day. Even if you do not want to utilise any car-pooling app, you can still plan ahead with your friends and family, or colleague who stay nearby. We lived through that period of time, especially in the 80s and 90s, when driving was sheer luxury to many, and survived very well. Perhaps its time, that we start rebuilding community-relationship with our neighbours, friends, and family whom we can share a ride with to the nearest LRT station, bus stop, or work area (and subsequently call for uber for the short ride from your neighbour’s work place to yours). You live among hundred of people and you can’t even find one that head towards your work place area? “shame!”, your grandmother would have yelled – she knew all her neighbours, their children, their spouses, and their scandals, by name. No, I am not asking you to “invest” in an expensive and bound to be underused Coffee maker machine, nor a Nespresso machine. 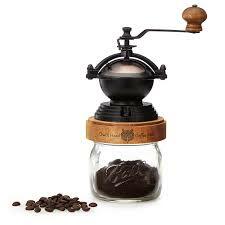 I am talking about good old manual Grinder, where you physically grind your coffee beans by rotating the handle. Many of us developed an addiction to coffee simply because of it’s caffein content. We don’t really know how to distinguish a Kopi Luwak, Artisan roast, from our off-the-shelf arabica. Marketing gimmicks by big coffee chains were proven to be very effective in manipulating our mind, to believe that a barrista served coffees deserves more credits and merits that they should have. With a manually ground coffee using a RM 70 hand grinder that you can easily get in AEON (I got one in AEON), you get to work out a little : to do a 30 gram coffee bean grind, to medium coarse texture, you need to rotate the grinder for about 10 minutes. It is a good form of work out actually especially for your delds, biceps, triceps, trapezius, and wrist muscles. All you need to do later, is to pour the ground coffee bean into a french press, mix it with 80 degree celcius water for 5 minutes and Voila. A nice cup of Americano is thereby readied! Latte/capuccino if you want to add in some lactose poison that were extracted through exploited animal in cruelty. instead of spending RM 5,10,15 on a cup of barrista served coffee, you only spend less than RM 1 on 25-30g of coffee bean everyday, plus some delds, biceps, triceps,trapezius and wrist muscles exercise. You essentially brough “hitting 2 birds with one stone” to a new tree. I am Three. with websites like GoBear.com , comparing credit cards couldn’t have been easier. Credit card companies were known to be ferocious in their marketing strategies to woo in as many users as possible, through offering competitive benefits. Afterall, it is the Merchants that they are aftering (Credit Card companies charges merchant fees from transactions done through credit card, and pressure them to accept credit card payment through consumers like us). A good starter credit card like Maybank 2 cards requires a minimum earning of only RM 2,500 per month to qualify. Once approved, you get 2 cards : 1 AMEX, and 1 VISA/MASTER. for AMEX, you get 5 times point per RM 1 you spent, PLUS weekend cashback of RM 50 per month max. what can you do with the 5 times points? NO. I do not recommend exchanging luxury goods. those are vanities that we don’t always need. Instead, look for their treat points catalogue and go for Groceries Voucher. Maybank for instance, offer RM 100 worth of AEON voucher for 43680 points . Thats 437 points per RM1. If you are using the AMEX Credit card, every 437 / 5 = RM88 you spend, you get a Free RM 1. Just by using their credit card. 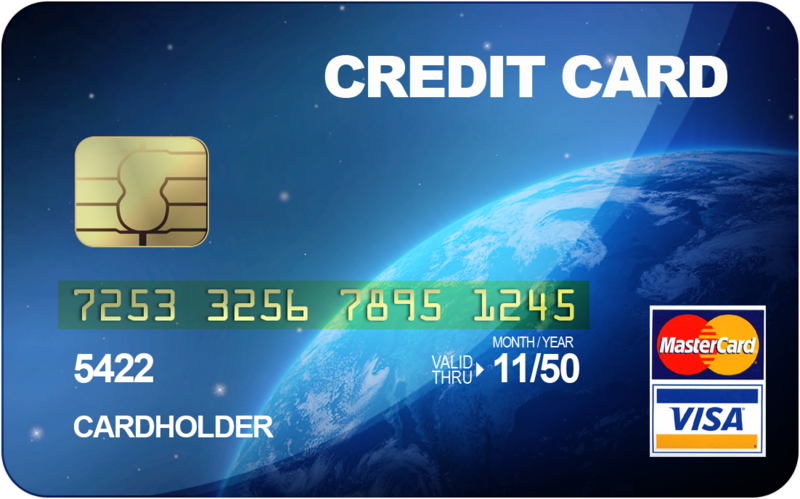 Pay your bills, (Electricity, Water) and others with your credit card. Collect these points. and turn them into groceries voucher. If you spend RM 880 per month on AMEX Credit Card (Maybank), you literally earn RM 10. 3 months and you get RM 30. 6 months and you get RM 60. literally out of no where. Spend that RM 60 on your groceries, that can last you a week. you get TWO weeks of free groceries, courtesy of Maybank Credit Card. Imagine if you are travelling abroad, and bought tickets with your card. That’s THREE weeks free groceries for you. Just by using a point credit card. The caveat however, is perhaps as important as the hack : PAY BACK what you use, online, every other day. DO NOT incur debt, nor should you sleep over it. You risk paying very high interest for accumulated debt. In productive countries like Korea, Japan or USA, “lunch” is overrated. Perhaps thats why they can invent your Galaxies and Iphones and we cant : They are simply more hardworking, working harder, and smarter than us, while we munch our RM 8-10 NASI EKONOMI for AN HOUR or more during mid day break. Why bother wasting that 10 minutes commuting to lunch area / restaurant / eateries just so that you get to SPEND MORE, to hang out with the very same colleague whom you are to meet for the whole day? Try to google up some 5 minutes OR 10 minutes breakfast/lunch tips and prepare your own RM 3-5 breakfast and lunch, and MUNCH them along with your colleague during lunch break in the office. You save time travelling/commuting, and you save money from eating out, and with you preparing your own lunch, you get to decide what healthy foods to put in too! 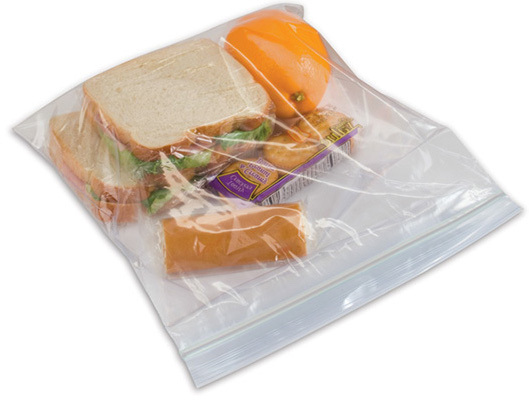 A reuseable ziploc bag ensures that your food remain fresh and nice even after a day. Try it now! Chances are that if you don’t see a thing for 3 months and never thought about it, you might not even remember you ever owned it. The last grass cutter you bought? the little metal tray you thought that you loved so much when you bought it in Penang, and then never got a chance to use it? I assure you that I have NOT read Marie Kondo’s “Tidying up” but it doesn’t take a genius to notice what “hoarding” is all about. Pack all these things up every month, and send them to the nearest BUY SELL and TRADE to your house. Tell yourself, that you are not disposing them to trash site. You are sending them to places where they would be cherished, loved, and utilised better by people who needed them more. Imagine them landing in a place where they are treasured instead of hidden. 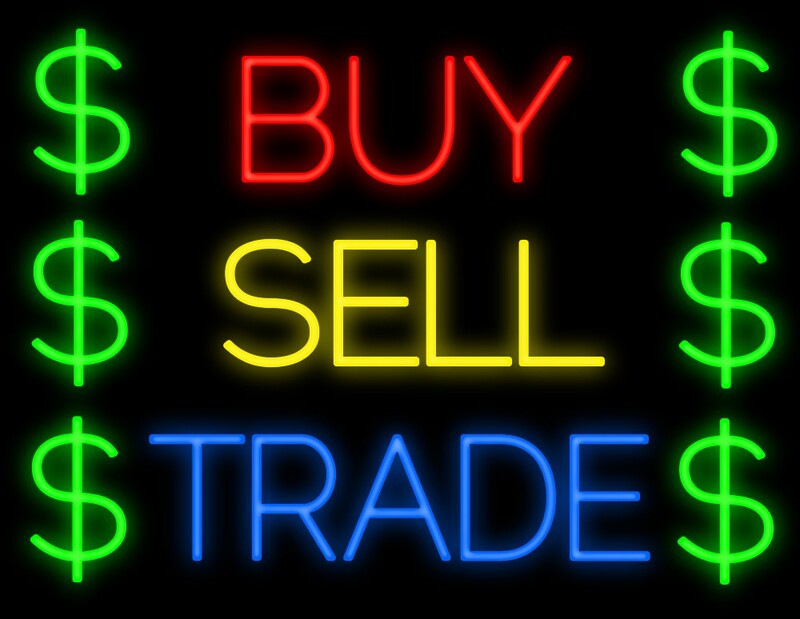 Truth is, Those who actually buy things from BUY SELL and TRADE are probably not as well off as you are, OR that they are thrifty people who are always on a bargain hunt. Their thrift would naturally prevent them from buying things that they don’t really need. So you can seek comfort in assuming that your pre-loved / pre-owned chattel are most likely to end up being utilised to their full capacity. By practicing these 5 hacks you might realise the fun in saving money too. Imagine the amount of money you can possibly make just by tweaking your lifestyle a little. Start now before it’s too late. 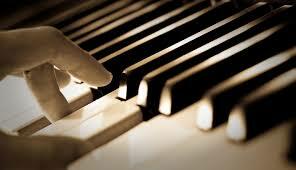 We are currently workingon a project to provide Piano Musics Rendition Services for interested parties. The concept is very simple : You give us a song title, we take some time to work on the Piano Rendition of the song, and then we send you the end product (which is the piano rendition of the song requested) upon completion. 1.) What is Piano Musics Rendition? – as mentioned above, we provide the “piano” version of the song you like, and return, charge you a service fee for that. 2.) What Kind of songs can we request? – basically most of the songs out there with proper melody. That includes more than 90% of the songs in market. 3.) What kind of songs that you guys CANNOT do? – Noises, non-melodious percussion, over-complicated philharmonic orchestral pieces, hard rock/ electro / techno musics without clear melody/harmony, non-harmony/melody chants (but most hymns or melodious chants are doable), or speaking tonnes are OUT of our range. They won’t sound nice in piano either. 4.) Can I request for Piano rendition with some rhythmic accompaniment, like beats? – Yes, you can, but that would require longer time and extra fee. 5.) What should I send you when I request for a song to be made into piano rendition? – Please send us a youtube link/ URL link /music MP3 attachment of the song you would like us to play, and that would be enough. make sure the music is clear and audible. It doesnt have to be in extra high audio quality. basic audibility is good enough. 6.) How much do you guys charge? 2:30 minutes (cap) rendition will cost RM 50 (consider the notation/practice/recording/touching up/delivery). 7.) What if the song I request is below 2:30 minutes? the minimum charges is RM 50 for 2:30 minutes regardless on whether if your music is below 2:30 minutes or not. The effort to produce a proper Piano Rendition does not differ much when it’s below 2:30 minutes. 8.) Do i get discount for more order? – Yes, for every 10 songs you order within 1 email, you get a free song. 9.) How do you deliver the songs to me? a.) Free Delivery – we can email the end product to you. for free. b.) RM 10 – Audio CD file – we can burn your songs into Audio CD, and have it delivered to you VIA Pos Laju. c.) RM 20 – USB Drive – we can also load your music into a USB drive, and have it delivered to you VIA Pos Laju. We will be using basic USB 2.0 drive. 10.) Can I pass you my USB/CD for you guys to load the music into? – Unfortunately, this arrangement is not logistically viable for us. So the answer is, “no, for now”. 11.) How long do I have to wait before my music is produced? – The standard waiting time for a song, is minimum 72 hours after our confirmation of your order. However, if we manage to complete your song earlier, we will have it delivered to you upon completion. – If you order in bulk, please allow more time for us to work on your songs. We shall deliver them in phases. 12.) How do I place order of songs, and how do i pay? – You can choose to pay via Direct Transfer (online), or Direct Deposit. Bank account detail will be shared with you in the form of email. 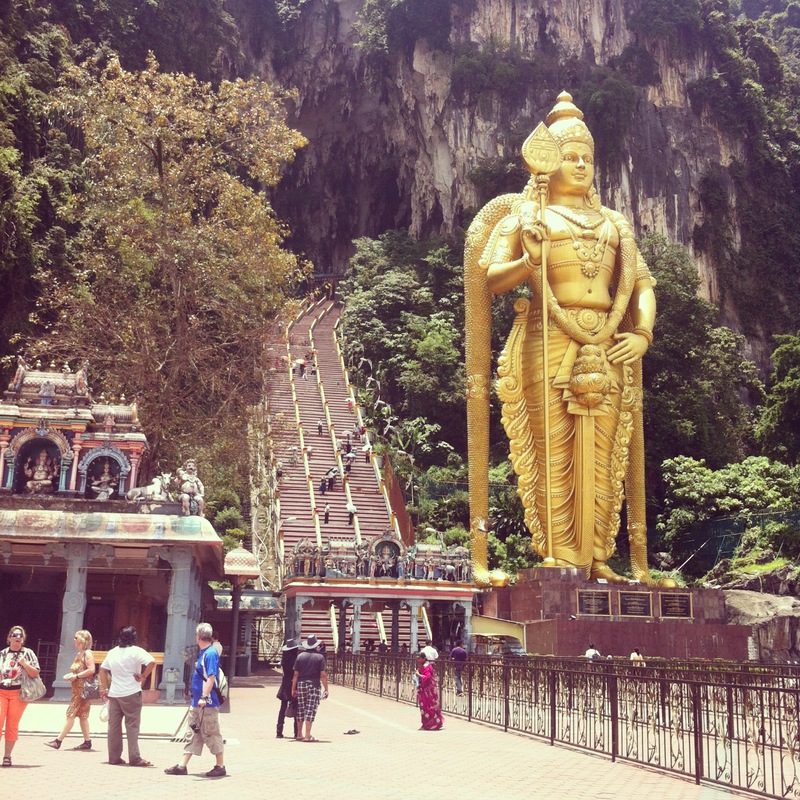 Thaipusam – do you know what this day is all about? Thaipusam is a combination of two words, namely THAI, and PUSAM. “THAI” is the name of the particular “month” according to the Tamil Calendar ( refer here for a glimpse of a Tamil Calendar –> http://www.tamildailycalendar.com/ ). “PUSAM” is the name of a “star”, which is positioned at the highest point during the THAIPUSAM festival. Many mistaken that it was a celebration of Lord Murugan’s birthday. according to a research by Murugan.org, (refer here –> http://murugan.org/research/duraiswamy-vaikasi-visakam.htm ), the birthday of Lord Murugan is actually “Vaikāsi Visākam”, celebrated in the Vaikasi month, (May/June) . There was a demon Asura (Asura are like demons. if you play alot of internet games, you will know the ability of an Asura) named Tharakasuran/Tarakasura’s. Tarakasura, and his demon “asura” army, attacks the Devas (if you know bahasa Melayu, Dewa Dewi punya Dewa lah). Some said, Tarakasura disturb the rishis, saints, Devas. Some said attacked. The Devas, unable to fight off Tarakasura, prayed to the Great Shiva for help. Lord Shiva and his Wife, Parvati, then called upon their son (some said, “create”) Lord Murugan, to help to fight off the Asura army lead by Tarakasura. Lord Murugan was given 11 celestials weapons by Lord Shiva his “father”, and also 1 particular powerful weapon called the “VEL” given by his mother Parvati. It is said that Lord Murugan then led the Devas, to defeat Tarakasura’s Demon Asura Army, with the “VEL” Parvati gave it to him, ON the THAI month, where PUSAM/POOSAM star was at its highest point. Hence the celebration of THaipusam. and the “VEL” is manifested in some of the Kavadi, IE the “VEL” Kavadi, which will be elaborated below under the “KAVADI” section. Story is not as nice as the first one. According to another myth, Lord Murugan “Eavesdropped” his parents, when Lord Shiva (Father) was impoarting a mantra to Parvati (His mother). because of eavesdropping, Parvati laid a curse on him, and hence creating the “rule” that eavedropping must be punished, even if its your son. To seek for forgiveness and indulgence, Lord Murugan then offered hard penance at Thiruparankundram (A town in Tamil Nadu). Lord Shiva and Parvati were pleased with his repentane and lifted the punishment / curse. the day in which the curse was lifted, was the “Thai Pusam” day. yes, you didn’t read wrongly. THe Kavadi in “kavadi attam” is that kavadi thing you already knew. Kavadi attam is a dance, related to the concept of “Bound by your debt” to Lord Murugan. In simpler words, it means you pray for something from Lord Murugan, and in return, you take on physical burden of Carrying the Kavadi during the Thaipusam, to Repay your “debt” owed to Lord Murugan when you make a prayer for wish. At Mount Kailas, Lord Shiva asked a sage by the name of Agastya to move two hillocks/mountain/hills, which are the Shivagiri Hill and the Shaktigiri Hill,to South India. The Sage Agastya, then ask his “disciple”, Idumban to carry the two hills/mountain to South India. He carried the two hills/mountain in the form of Kavadi, means each hill/mountain on each side of his shoulder (hence the KAVADI ! – read on). He couldn’t have moved the hill at first. but after praying to Lord Murugan, he found the strength to carry the two hills. This Disciple Idumban is a very special person. He was an Asura, who survived the Asura-Dewa warfare (the one mentioned above). After that, he sworn his loyalty to Lord Murugan, and prayed to him. Meanwhile, in another setting, Lord Murugan, and his brother Lord Ganesan/Ganapathi were in a competition to race around the world. His brother Lord Ganesan/Ganapathi won the race by just running around their parents, Lord Shiva, and Pavarti, signifying that they both were the “centre of the world”. Lord Ganesan/Ganapathi then claimed the price of the race, which is the “Jnana-pazham”/ or commonly known as the “FRUIT”. Lord Murugan felt cheated and angry for losing the race. He then went down to Tiru Avinankudi at the Adivaaram (meaning ‘foot of the Shivagiri Hill’ –> Shivagiri hill being one of the hill/mountain carried by Idumban the disciple) and rest there. His father, Lord Shiva then went on the “pacify” him, to mitigate his anger, by telling him that he, Lord Murugan, is the “Pahzam – Fruit” of all wisdom and knowledge. Hence the place that he was resting, was called “Phazam-nee – You are the fruit”, or “PALANI”. ……… (Continued above). This youth-dressing man then pursued a fight with Idumban, the hill/mountains carrying disciple, and kill idumban. After that, he resurrected Idumban, and revealed that he was in fact Lord Murugan. Therefore, if you were bothered to move yourself to Batu Cave, you would have seene Idumban shrine half-way up the hill where every pilgrim is expected to offer obeisance to Idumban before entering the temple. Since then, pilgrims bring their offerings on their shoulders in a kavadi, remembering Idumban. 4.) What kind of preparation for Kavadi Attam, and Thaipusam Celebration? They would fast approximately 48 days before Thaipusam. Kavadi-bearers have to perform elaborate ceremonies too. On the day of the festival, devotees will shave their heads and undertake a pilgrimage along a set route while engaging in various acts of devotion, notably carrying various types of kavadi (burdens) or Milk. Some uses Vel instruments to pierce their Skin. 5.) What Kind of Kavadi? VEL Kavadi Versus PAL Kavadi. THe most interesting Kavadi, would be the “VEL” Kavadi. if you’re forgotten what is the VEL, scroll upwards. It’s the “weapon” given to Lord Murugan by Parvati in the Asura-Dewa war. It is a portable altar up to two meters tall, decorated with peacock feathers and attached to the devotee through 108 vels pierced into the skin on the chest and back. Devotees claim that they will “enter trance” feel no pain, do not bleed from their wounds and have no scars left behind. Based on my personal observation with my brother Tai Zee How and Dimishtra Sittampalam , it seems that Devotees inhale alot alot alot of Weed during their Kavadi Attam. maybe that helps to relieve the pain too. Thaipusam is a very ritual rich and cultural celebration. I’ve the privilege of attending one with my close friends in batu Caves, and the experience was superb. The squeezing into the KTM which you can barely move (all Hindu devotees) from subang jaya to Batu Cave, and the crowd there was just amazing. You feel like as if you’re in PALANI TAMIL NADU and not Kuala LUmpur. As a Proud malaysian, we must at the very least learn, and understand the culture and history of one and another. I hope this post give you the sligthest idea of what is so significant to our Hindu brothers and sisters that this day is made a public holiday. THaipusam Vathukal to all my friends who celebrates it! Before you lend your money to a Friend or Family member, think this. ​My father taught me few golden rules when it comes to lending money to friends or relative, and they are very useful and effective tips ! 1) only lend amount that is immaterial to you that you must treat that it’s “gone”. It should bother your financial health and mustn’t burden you in any way. 2) with 1) in mind, never ask back the money, give as much time as possible to your friends and family to repay you. If they forgotten about it, you should forget about it too. Money should not be a reason to lose or sour friendship or family ties. 3) if the amount requested is too much and became material to you, or became burdensome, say NO at all cost. It’s better to be honest upfront even if it causes discomfort, than making the debt an ever lasting reason to further sour your friendship or family ties in long run while you chase for debt. 4) when a friend or family needed money for important things like to pay for medical bill or buy food because of poverty, and the borrower is close enough to warrant you to spend more than what is immaterial to assist, do not lend the money. 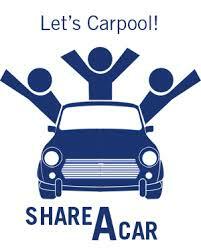 Spare some time, drive your friend or relative to the hospital or supermarket, and pay yourself. If you can’t do that, say “NO” too. 5) a friend whom you lend money to in the past, if he comes back to borrow more money from you before repaying the first debt, do not lend it to him. Say NO. You are not helping him. You are just making him taking you for granted. Again, unless he really needs it for important stuffs, offer to pay for the transaction yourself without giving him the money. 6) if your friend is a gambler, and is borrowing money to repay his gambling debt, say NO. Same applies to anyone who is borrowing money on behalf of his or her spouse, relatives etc. This is not helping. He should learn how to pay his own debt, even if it means being declared bankrupt. There are many bankrupts in this world, and they survived becoming better person after that. If it’s along that he is debted to, assist him to make police report and leave it as that. 7) above doesn’t apply when it comes to people you love very much. You must do all you can to help your parents, spouse, siblings even if it means you will be broke by lending money to them. But being a responsible family member of friend, you mustn’t stop at lending money to them. You have the duty and responsibility to help them to cope and resolve their issue in totality. Check them in a rehab, counselling, register them to AKPK, etc. 8) if a friend or family member borrow from you to start a business, advice them to take a bank loan, or demand for sufficient equity / stake in the business. Why so? First, banks are there to lend money to people who wants to start a business. If he couldnt secure a loan, it simply means he couldnt pass the diligent test on his business’ viability. The bank deems his business as being too risky and not worthy of an investment. So by borrowing money from you, he is passing the risks to you. 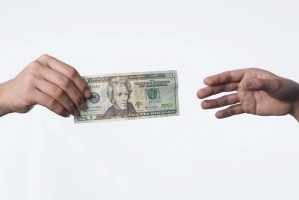 Why should a friend, pass his business risk to you without offering you a fair share of return? If he is not being fair to you, he is taking you for granted. If you are indeed being offered stake or equity of the business, threat this as a business partnership than a lending transaction : do all your due diligence, study his business model, give him your views, and take it as a form of investment rather than mere lending of money. These lessons have helped me to date. I have not sour any friendship because of money, and I never ask back what I have lend out. The best thing that happened this first week of the year : Implementation of No-Plastic-Bag ruling in Selangor. A lot of retailers have enforced it. We all should applaud this policy. If you do not want to pay for the extra RM 0.20 ( which, i hope can be increased to mandatory RM 1.00 as deterrent), please bring either your old used plastic bag, or a kain/reusable bag (you can get it at very low price in IKEA etc) when you’re out to shop. Also, you can consider bringing your own food container to dapao. The environment is not for you to harm further for convenient sake. you are supposed to feel the little “inconvenience” because that is the price you are suppose to pay to help reduce harm towards our environment – you are still harming it! don’t stick gold to our face just yet, just that we are reducing the harm. We are not even rehabilitating or improving it yet. 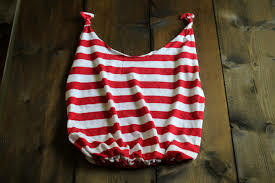 Here are some ideas on how you can make your own “Reuseable bags” and save cost on plastic bags. RON 95 – Calculate the price yourself! 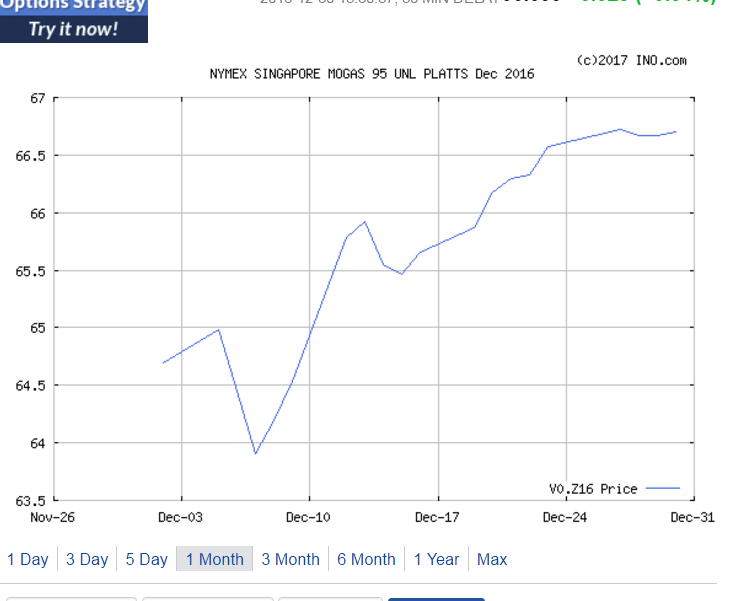 RON 95 went up by 20 sen over 2017 Near Year celebration in Malaysia. Once again, the new RON 95 pricing shocked and suprised the whole nation, and created another round of rage-suprise frenzy in social media and whatsapp. The feeling was pretty bad indeed. How human nature works, is when you don't mentally prepare for bad things before it happens, the bad feeling that comes along become significantly worse off when it finally hits. However, if one was to thoroughly prepare for all the bad things that are about to come before it happens, the perception becomes relatively bearable when it happens. How bearable will that be, is highly dependable on how prudent you are in overestimating your cost. So to save yourself from another potential rounds of rage, suprises and heart attacks over fuel prices, It's best that you start picking up on how to calculate RON 95 Prices. you can do so by the end of every month to predict the actual pricing. NOW, LETS LEARN HOW TO CALCULATE RON 95 PRICE! 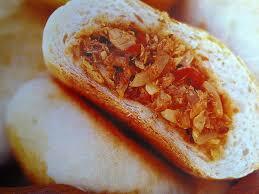 Sardine Bun : You bought a Sardine bun from Giant supermarket this morning, for RM 1.60. The RM 1.60 you paid for include the cost of, among others, Floor, Sugar, Baking Soda, Sardine, Seasoning of Sardine, Onions, Salt, Oil, Preservatives, Margin of the retailer, Transportation cost, Packaging etc. Each of these ingredients and element incurs certain amount of cost. If you want to know the detailed breakdown, you can always go to the manufacturer and retailer, befriend with their accountant, and ask for them to reveal their cost to you. Fortunately you dont have to befriend a retail oil company accountant to know your RON 95 pricing. 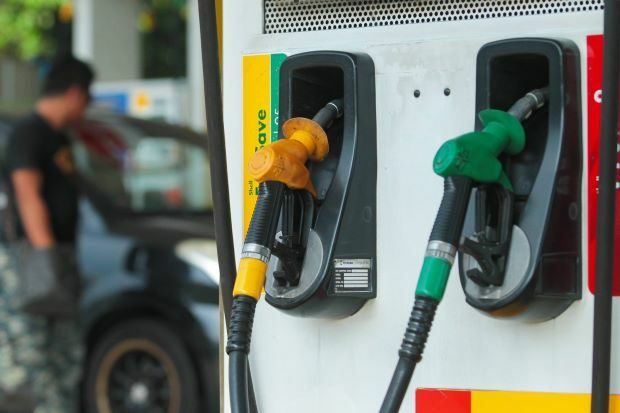 RON 95 Petrol : Your litre of RON 95 include costing for the actual refined oil (based on MOPS pricing), alpha, operation cost, oil company margin, dealer's margin, and before 1st April 2015, Sales tax (Which is now abolished because RON 95 is not GST-taxable). 2.) How much is the cost of the individual item listed in RON 95 cost breakdown? First we need to know, that these costings were done according to the Automatic Pricing Mechanism (APM) system implemented on 2nd April 1983. The Regulation implemented then in 1983, listed exactly how much these costings are, to the micro sen. or nano sen (whatever). Scroll down to the bottom of this post and refer to Appendix 1 if you want to read the actual APM document, released in 1983. So from this Table, you can see, that summing up point 2-5 you get a fixed cost of RM 0.32 (round up from RM 0.3173) per litre. IT MEANS that even if one day when Refined Fuel oil become FREE, you still have to pay RM 0.32 per litre for your RON 95. IT's like, if one day FLOUR become free, you still have to pay for other cost of your Sardine bread too right? the sugar, packaging, transportation cost, retail shelf place etc. in 1909, Mr Warren C. PLATT (1883-1963) published the "National Petroluem News", and lateron in 1923 he published the Newsletter "PLATTS OILGRAM" which was an influential reference for PETROLUEM PRICES. So, in honour of Mr Platts, the Petroluem price circulation that he used to publish, is now named after him - PLATTS. 4.) What is the different between Pricing from Brent, West Texas, and Means of Platts? Brent and West Texas are used to indicate CRUDE OIL price. 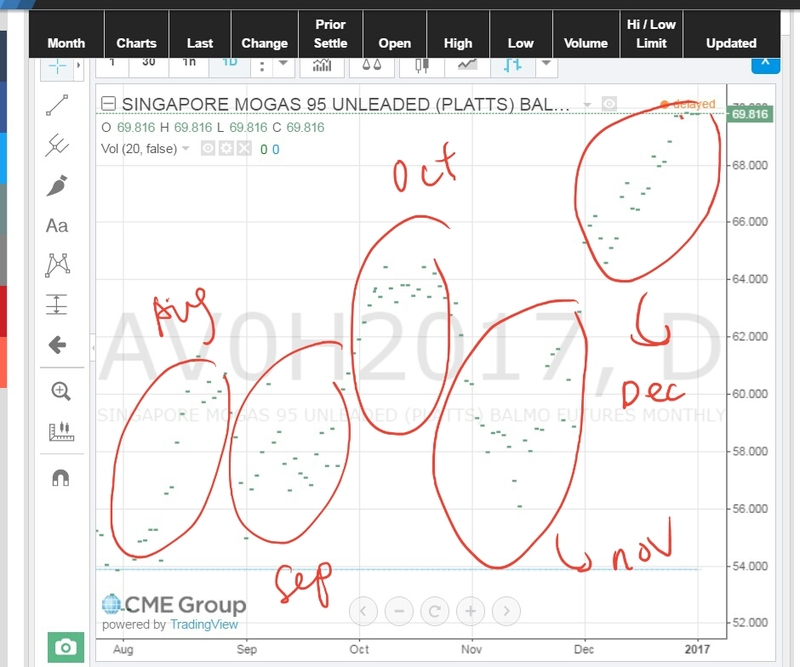 Means of Platts is used to indicate PREMIUM/REFINED OIL price. in our case, MOPS 95 for RON 95. Think of Crude Oil, analogically, as your raw Chicken. The price of Raw Chicken, and cooked/treated chicken served on your plate in a restaurant is very different. 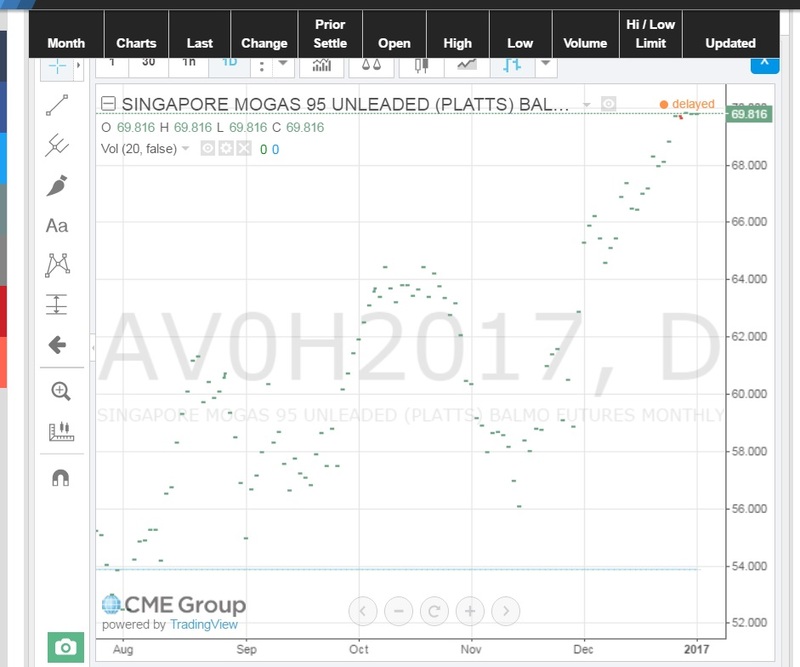 Brent/WTI is used to measure the raw chicken price, while Means of Platts is used to measure the price of your Chicken Chop/ Chicken Maryland / KFC Spicy Dinner Plate. It is almost certain that the price of the latter is always higher than before. 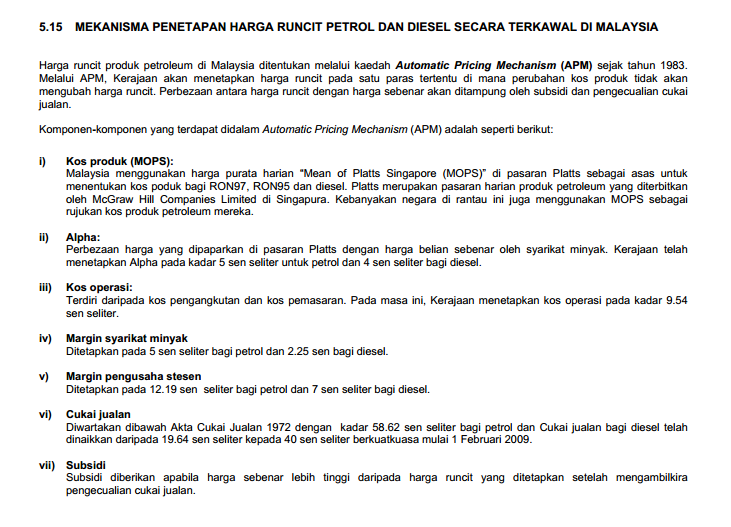 So when you want to calculate the price of RON 95, which is refined for your car use, use the Means of Platts. They were used by most South East Asia country and also Australia. However if your car runs on Crude unrefined oil, (maybe you have invented one in your garage. who knows?) then you can proceed to use Brent and WTI to calculate your RON 15 price. or RON 5. or RON8. i don't know the octane number for unrefined/Crude oil, or if there is any Octane number at all. And if you are want understand how Platts calculate refined oil price, you can read them here. 5.) How do you calculate the MOPS cost in our Malaysia's RON 95? once you get this graph, you have to start to do some home work. If you remember, our price (APM) is adjusted every month instead of everyday, and the price of the coming month is based on the average index of MOPS Ron 95 (Mogas 95) of the current month. So you will have to get the index quote for the whole month, add them up, divide by 30 to get the "Average" MOPs Price. Whatever number you get for the month, would be your amount RM X for the next month's RON 95. 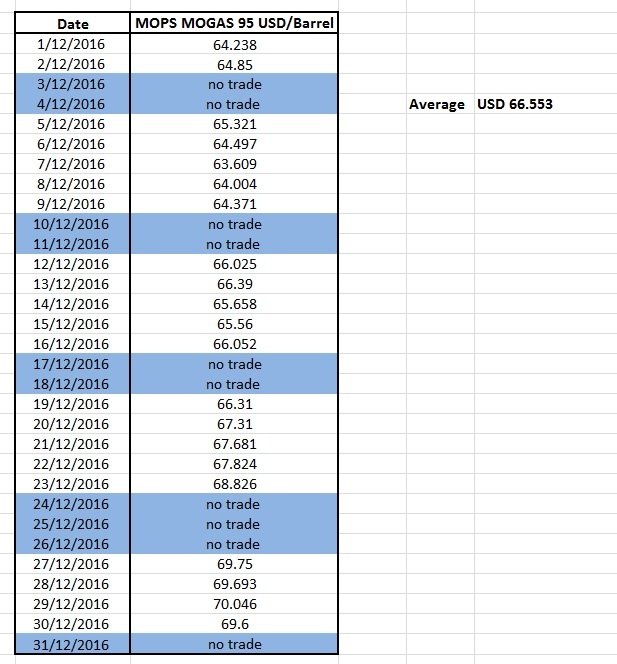 IE, in the above graph, December's Average RON 95 MOGAS MOPS pricing will be the base RM X for January RON 95 price in Malaysia. With that, lets first convert from barrel unit to Litre, which is what we use. The Conversion ratio is, 1 barrel = 159 Litre . Also for December, the Exchange rate between USD and MYR was about USD 1 to MYR 4.49.
and 1 litre of December RON 95, would cost you RM 1.87938 on MOPS alone. now, you have managed to get hold of the MOPS pricing for december 2016 (RM 1.87938). 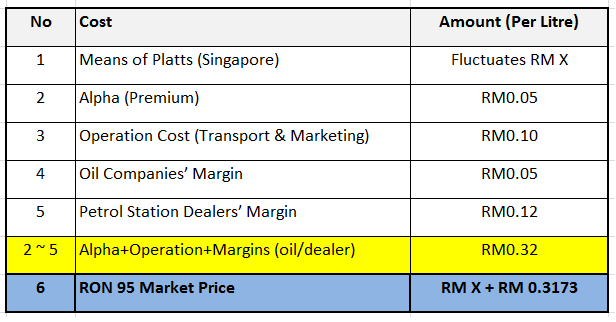 So to calculate January 2017's RON 95 retail pricing in Malaysia, add up the MOPS average monthly price (RM 1.87938), and the abovementioned other costing (alpha, dealer/oil company margins, operation cost) of RM 0.32.
currently, you are paying RM 2.10 for it because the Government "STILL" subsidize it. If not, based on APM, like what is adapted by most countries in the world, you would have to pay RM 2.20 instead. Conclusion : be kind to your heart, and stop exposing it to shock and rage. Do some calculations and prepare for what is coming the next month ! You can predict the price and impress your friends by your prediction, because they are quite accurately reflected most of the time.